This is the group that scored the highest across all the categories. So, they had the best balance of creativity, innovation, and technology. This is the group that used difficult technology well and in an interesting and unique way. They mastered the ability to prototype quickly and cleanly. This is the group that the judges felt really hit it out of the park with their user experience and interface design. They created something that looks professional, unique, and appealing. We empower smart, passionate and motivated people to build amazing things. Let's start something. 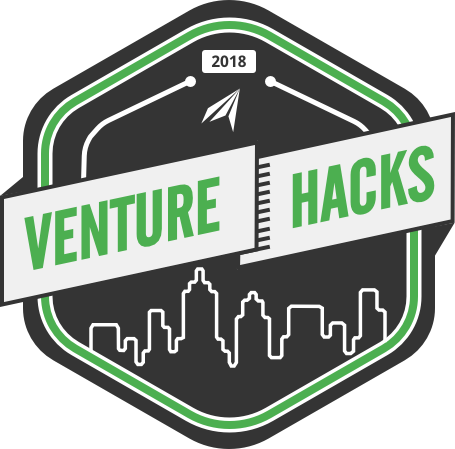 Venture Hacks is an ongoing series of hackathons sponsored by the Stevens Venture Center. The Venture Center aims to redefine entrepreneurial education and support rising student entrepreneurs. We're seeking the next generation of budding talent for a weekend of learning, building, and growing. We empower smart, passionate and motivated people to build amazing things. Join the revolution in hackathons. All Freshman and Sophomores of Stevens Institute of Technology. Any website / web app / approved others. Do not necessarily need to use technologies presented in the sessions. For submitting, upload a zipped folder containing everything you've done this weekend. Applications have unfortunately closed. If you're in, you know who you are. But you're all awesome. We're looking for ambitious, professional, and functional designs that just work. While the theme is entrepreneurship, the medium is through tech. We're looking for great technology used uniquely. Here we are. This is what matters. How viable is your project? Where's the pain?